Children can use surveys just as adults do—to collect information from other people. Surveys can help them find out about others’ opinions, preferences, predictions, and experiences. Taking part in a survey can spark children’s personal interest in a project and increase their engagement with the topic, with classmates, and with others around them. A class can also use surveys to involve parents and other community members in a project. Some teachers like to start by finding out if the children know what a survey is. They then explain the basics of surveys before doing a trial survey with the children. Others find that preschoolers have better attention for the lesson when the teacher “walks them through” a real survey first. The second approach is described here. 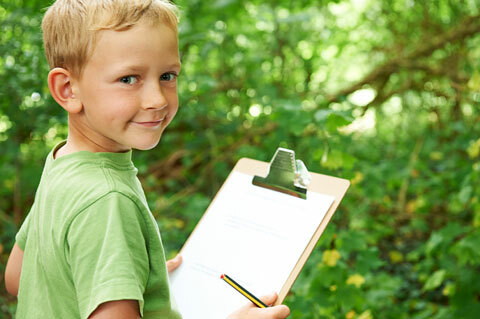 Children can start taking surveys during a project as soon as a topic has been chosen. When you introduce survey taking, it helps to have a question in mind that is related to the topic. Most teachers like to start with a question that has just two possible answers, such as “Yes” and “No.” You might use a question that a child has already asked during a class discussion or make up one of your own. Tell the children that you are curious about something and you want to find out what they have to say about it. You will show them one way to get that information using this form. Print the question that you want to ask at the top of the page, saying the words as you write them. Repeat the entire question when you are finished writing. (Tell the children that you are not ready for them to answer yet.) Explain that you think some people might say “Yes” to the question and some might say “No” (or whatever your two options are). Print the two possible answers in the spaces immediately below the question, saying the words as you write them. Tell the children that you are going to read the question out loud again and after that they can take turns telling you their answers—Yes or No. Read the question to them. Start taking their responses one at a time. (Decide beforehand if you will record their responses with tally marks, checkmarks, initials, or names.) Continue as long as the group is engaged. You need not get every child’s response during this part of the lesson. If the children’s attention seems to wander, stop after five to six responses and tell them that you will get the rest of their answers after the class meeting. Tell the children that the activity you have just done with them is called “taking a survey” or “conducting a survey.” Explain that a survey is a way for you—and for them—to find out what other people think by asking carefully chosen questions. Show the class your survey form with the responses that you have recorded. Remind the children that you were curious about how they would answer your question. Repeat the question. Tell them that you now have collected all your data from them and are ready for the next step—finding out how many people gave each of the possible answers. Choose a column and have the children count responses in that column with you. Print the numeral that represents the total for that column. Do the same with the second column. Figure 1. Example of a simple survey format. Learning about (and from) surveys can touch on several areas of the curriculum and classroom life. Make surveys part of the daily routine. Have a daily “sign-in sheet” constructed as a survey form, with a question related to the project topic, near where the children enter the room. An adult can stand next to the survey to read the question and the response options aloud as needed. Some children may need help at first to figure out where to put their checkmarks or names. Make time to discuss the data during class meetings. Figure 2. Example of daily sign-in board with Velcro-backed name tags. Introduce terms such as information, response, option, sample, total, template, data, column. Invite the children to think of some possible survey questions. These questions can reflect what they are curious about related to the project topic. Choose one and create a survey form on easel paper or the writing board with input from the class. Allow time during the day for them to respond with marks, initials, or names. Model the use of several types of questions. For example, to help children recall events of the recent past, ask questions related to their own experiences—for example, “Have you ever flossed your teeth?” “Did you see the false teeth at the dentist’s office?” Questions that involve predictions can give children a basis for some of their fieldwork. (“Do you think we will see toothbrushes at the dentist’s office?”) It’s wise to move beyond basic “preference” questions (such as “Do you like to brush your teeth?”) when possible. Use other approaches to expand beyond simple “Yes/No” questions. An “Agree/Disagree” format lets you start with a “controversial” statement. For example, “Animals do not have dentists: Agree or Disagree.” Response options such as “Sometimes/Never” or “Often/Sometimes/Never” help to engage children’s understandings of time. Show children how to use pie charts to represent their results. Figure 3. Survey form constructed as a bar graph. As the project moves along, other lesson plans might focus on encouraging children to create surveys of their own. Help them write survey questions to ask their classmates. Some children may want to conduct surveys individually. Others will be more comfortable working in pairs or small groups. Offer writing tools, clipboards or stiff cardboard for backing, and photocopied survey templates with space for two to four response options (or let children make their own templates). Encourage children to write or represent their questions on their own at the top of the survey form, but provide help if they ask for it. Children can take surveys during any phase of project work, so your survey-related lesson plans may vary depending on other classroom activities. In Phase 1, help children focus their surveys on people’s opinions and experiences. Their questions might include, “Do you like to go to the dentist?” “Did you ever lose a tooth?” Encourage the children to ask classmates, family members, and school staff to respond to the survey questions. They can report their results during class discussions and invite classmates to check their totals. As the children become familiar with surveys, you can plan lessons that prepare them to take home a survey for family members or neighbors. It usually helps to think beforehand about how much to guide children’s survey-making processes. Some teachers are comfortable letting children try a survey question or response choices that may not seem workable to an adult. They find that the children learn firsthand from any confusion that results and will try again with different survey questions that may work better. Other teachers prefer to give children feedback that highlights possible problems. Do you find that some children have trouble formulating questions? You might plan a series of brief lessons to help them move from wanting to “find out about” something, to putting that curiosity into words. For more information, see Project Approach: Helping Children Ask Questions. Use survey results to spark more discussion about the project topic. As the children talk about a survey, listen for their additional questions, their understandings, and their misunderstandings. Plan lessons or additional experiences based on what you hear from them. Do some children need extra help figuring out what their results mean or reporting their results to the class? You could plan lessons focusing on class discussions about survey results. Approaches to evaluating and assessing children’s progress vary from program to program. Keeping track of a child’s work on surveys can help a teacher see what a child knows about a topic and the ways that his or her knowledge and skills change over time. Over the course of a few months, a child’s survey forms may show both a baseline and progress in how he prints letters, makes letter-sound correlations, and so on. Anecdotal records of a child’s participation in survey taking or her contributions to class discussions about survey results may show changes in her understanding of a topic, her ability to communicate her ideas to others, her number sense, and her peer relationships. Survey activities are ideal for including children with special needs in the social and intellectual life of the classroom. In fact, some goals in a child’s IEP or IFSP may be related directly to key features of participation in surveys. A child who has difficulty interacting with peers may be comfortable with the survey’s highly structured questioner-respondent relationship. A child with special needs may benefit from having illustrations that represent the question and possible responses. Children who have only minimal expressive language can respond to surveys in a variety of ways (nodding, pointing, making a tally mark, etc.). A child with language delays may benefit from practicing a survey question before asking classmates. Children who have fine motor difficulties can make marks instead of printing their names. Counting survey responses along with classmates may be helpful to children who have difficulty with number concepts. A child with special needs and a typically developing child can both benefit from conducting a survey as partners. If you work with children whose English skills are still emerging, use pictures or other visual cues for the first surveys that you conduct with the class to help children understand the content. Sending survey questions home with children is a useful way to involve families in a project. When children are ready to conduct surveys of families and friends outside of school, it is important to make a point of having a knowledgeable person translate survey questions from English to other languages represented in your classroom. Parents’ responses should be translated back into English, as well. Have the whole class count survey results together in languages other than English. 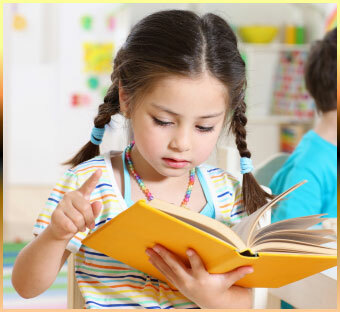 Ask an English-speaking child and a child who is learning English to take a survey together. Illinois teachers of young children are often asked to include state early learning and development benchmarks in their lesson planning. The chart below suggests benchmarks that are frequently met through survey-taking activities in preschool. Other benchmarks may also be addressed. children create surveys following teacher’s instructions. children respond coherently to teachers’ or classmates’ survey questions, showing that they comprehend the question and what they are being asked to do in response. children repeat their survey questions aloud for classmates or others to answer. children reply to questions asked of them by the teacher or classmates. children discuss survey results during class meetings. children formulate or co-create survey questions about things that interest them. children write, dictate, or copy words to create text for their own surveys. children use surveys to find answers to specific questions. children watch the teacher construct a sample survey, writing in the question and the responses at the top and with words proceeding left to right. children construct a survey page with the question at the top. children write their own names in response to a survey question. children represent the survey question or their own names through letters or other symbols. children dictate a response or sign their names or make identifying marks to signify opinions about a survey topic. children develop survey questions related to a topic of interest to the group. children collect responses through direct interactions with others. children test predictions that they made during a survey. children report survey results to classmates, referring to the survey forms to show results. children count together or individually to determine how many responses fall into each category. children use survey forms that also function as simple bar graphs. children use visual cues and counting to determine the relative number of responses to the question. with an adult or independently, children develop survey questions related to an area of interest. children find out about others’ ideas, opinions, and experiences on topics of mutual interest by asking questions in a survey. children use survey forms constructed like graphs to keep track of and quantify responses. children create surveys to learn about the ideas of peers and adults. children use surveys to find out about others’ ideas on a topic. the class tallies survey responses to help make decisions in which the majority opinion matters. children compare their own survey responses to those of classmates, relatives, and acquaintances. children begin to note trends in responses. children copy or write survey questions on paper. children write their names or make other marks in response to a survey question. children explain the survey question effectively to others and request their participation. children respond to questions about their ideas and preferences by marking a survey sheet. children use surveys to find out more about project topics and about the ideas and interests of those around them. children familiar with the process spontaneously create and take surveys, individually or with partners. when analyzing survey results, children notice varying opinions among classmates. children collaborate with classmates and teachers to create surveys. children interact with classmates, teachers, and others during survey taking, learning about interests and experiences that they have in common as well as differences. Make decisions: What information do we want to collect? Which people should we ask? What survey format will help us get the information? Reflect on their own thinking: What do we want to find out? Take others’ perspectives: How can we best phrase our question so that others will understand it? How might someone else answer this question? Communicate with peers and adults: What is the survey question? What are the response options? What are the survey results? Use their understandings of number and their counting skills to compare sets of responses. Use writing or other symbols to represent the responses (for example, by making a checkmark or printing their initials or names). Use their understandings of number and their counting skills to determine, compare, and discuss survey results. You may want to mention some of these additional benefits when creating lesson plans related to involving the class in taking surveys.